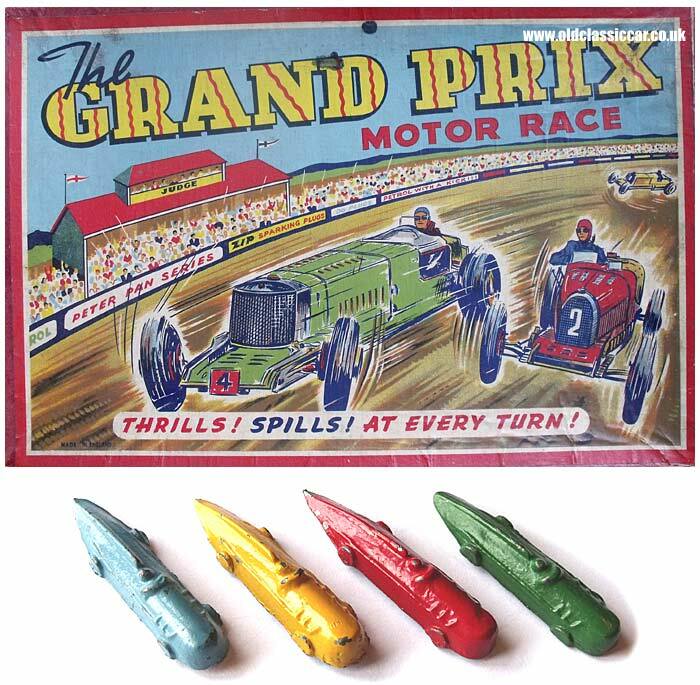 The Grand Prix Motor Race, a board game by Peter Pan. Homepage. This page: A vintage motor racing board game from the Peter Pan Series. "The Grand Prix Motor Race" from Peter Pan. Post-war motor-related board games, for instance Motor Race by Glevum Games, turn up quite frequently still, but pre-war examples pop up with much less frequency. I would date this game - titled "The Grand Prix Motor Race" - to the late 1920s, or early 1930s, and it's from the Peter Pan Series. The box features two cars vying for the lead of a race, the red car being very reminiscent of a Type 35 Bugatti, a racing car built throughout the 1920s in a number of versions. I can only imagine at how excited a young child would have been when they received this game, perhaps as a gift at Christmas or for their birthday. The player was promised "THRILLS! SPILLS! AT EVERY TURN". "A game for two, three or four players. To commence players arrange their cars on the starting line. Each player must throw a six on the dice before he can move his car from the starting line and then takes another throw. Once a player has thrown a six he moves his car along the track. If he arrives on a number bearing instructions he proceeds as indicated. The winner is the first player reaching the score of 100, but he must finish on exactly 100 before he can claim to be the winner, that is he must throw the exact number required." 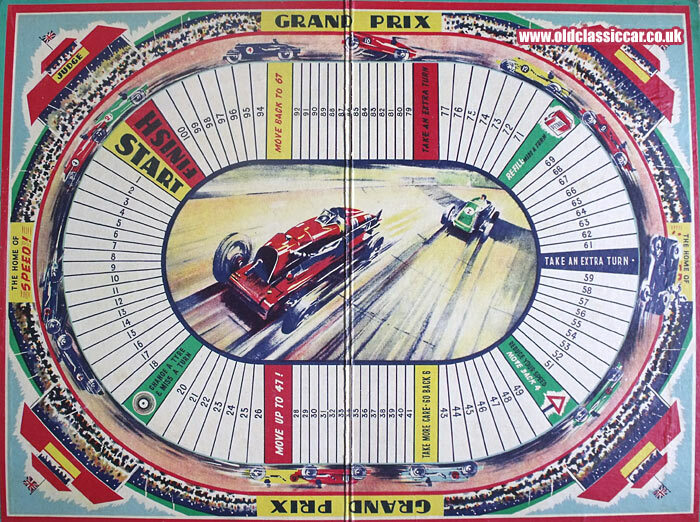 The game board is a colourful portrayal of a racing circuit, with two fine Brooklands-type racing cars at its centre, and racers around the outside being cheered on by the crowds in the packed grandstands.